This support bracket is meant to work with some of our straight hanging rails, such as our 24" long hanger bars or 48" long hangrails. The support bracket secures one of these straight hanging rails to create a clothing display, able to hold a wide variety of clothing including shirts, jackets, pants, shorts, skirts, or shawls, to name just a few. 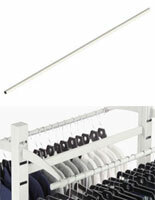 The support bracket, also known as a mounting bracket, is an integral component to this type of clothing display. 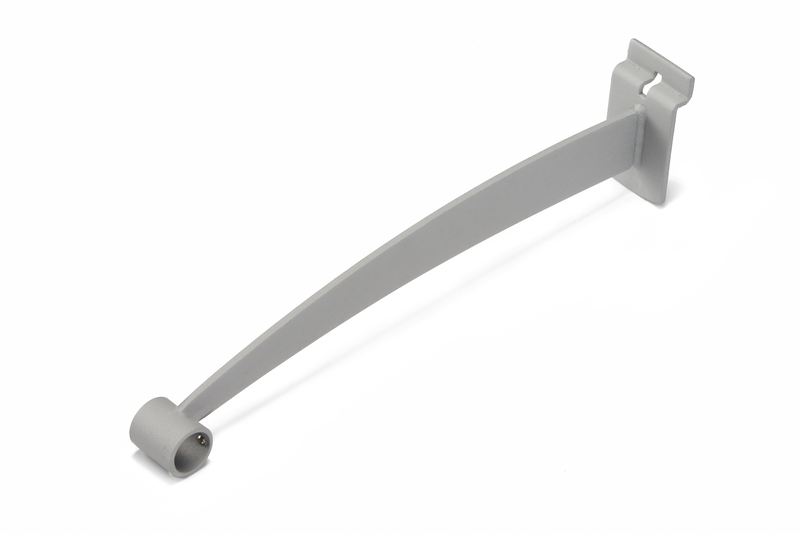 Our support bracket provides side support for hanging rails by tightening two screws against the rail. This side support also allows the retailer to move the clothing display as a single unit instead of 3 individual pieces. Two support brackets screwed tightly against a hanging rail can be lifted out of the slatwall and moved to a different location as a single unit. 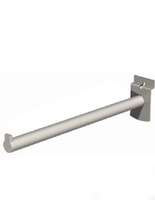 The retailer will not have to unscrew the rail and move 2 support brackets as well as a separate hanging rail. 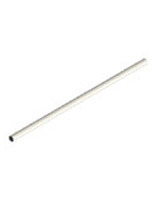 This side support is the perfect support bracket for clothing displays. Please Note: This unit is sold individually, not as a pair. 1.3" x 0.75" x 12.5"